When garage door automation started taking off in America, it was the chain-driven opener that led the way. This is partly why it’s still the most popular kind found in most homes today. The other reason is that this mechanism is extremely durable and reliable. But, like all mechanical systems, even chain driven doors can succumb to wear-and-tear over time. At Garage Door Repair Lake Mary, we’re experts in repairing all the common issues associated with openers. We can take care of the broken chain for you, and adjust the limit screw if the door appears to be crashing down during closing or not opening fully. Belt-driven openers tend to be favored by homeowners who appreciate their quiet operation. So it could come as a surprise if you start to hear your door start to squeak or make other unfamiliar noises. Usually, this is just an indication of nothing more than a dirty belt which needs cleaning, or perhaps a wheel that needs some oil. We are equipped to carry out a full diagnosis of the problem. You can trust us to try to repair any part if possible before suggesting a replacement. In the event that you do need a new belt installed, our skilled technicians are more than prepared to handle it. Dealing With A Faulty Screw Drive Opener? Screw drives tend to be quieter than chain drives, but cheaper than belt driven openers making it a great compromise. This model also tends to be simpler to maintain because there are far less moving parts - still, this doesn’t mean you won’t experience the occasional issue. Whatever the problem that arises from your screw driven opener unit, be it a stripped carriage or coupler that has worn out or a trolley that needs to be replaced, we'll carry out the work in a professional manner. 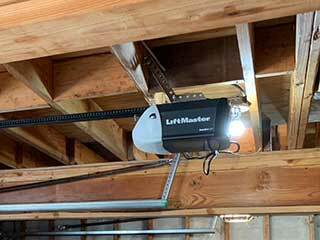 Good maintenance is the key to extending the life of a garage door opener - it’s advisable to have a tune-up carried out at least once a year. We certainly believe that prevention is better than the cure in the long run, which is why we offer a comprehensive maintenance service which includes a full inspection of the opener unit and the chain or belt if you have this type of unit. If you're in the market for a new opener, we can also help you choose the right model for you and look after all of your installation needs. Just get in touch to arrange an appointment time that suits you!